Rippon Lea House and Garden is Australia's best example of a 19th Century suburban mansion in its original landscaped garden setting. Admire the impressive architecture and the mansions' elegant 1930's interiors. After you have explored the incredible 33 room mansion, head out into the gardens. Wander around 14 acres of sustainable garden; discover the ornamental lake, heritage orchard, extensive fernery or picnic on the sweeping picturesque lawns. This incredible estate has beautiful garden tours that run every week on Wednesday and Thursday at 11 am and Friday at 2 pm. Not only this, but they run numerous other events throughout the year, including vintage fashion markets, barefoot cinemas and vintage pool parties. Head to their website to find out when these events are occurring. 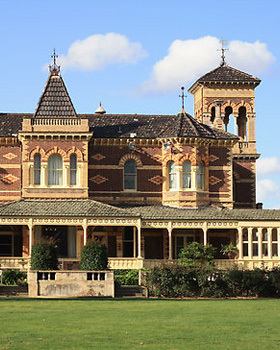 Rippon Lea House and Gardens is located in Elsternwick, only 7 km from Melbourne’s CBD. The closest train station is Rippon Lea Station, on the Sandringham Line. The tram stop is number 42 on Tram Route 67 (to Carnegie).